Record-breaking Canadian astronaut Bob Thirsk has returned to Earth after six months aboard the International Space Station. Russian Space Agency recovery personnel climb atop the Soyuz TMA-15 space capsule after its landing in northern Kazakhstan. ((Shamil Zhumatov/Associated Press))Record-breaking Canadian astronaut Bob Thirsk has returned to Earth after spending six months aboard the International Space Station. A Russian spacecraft carrying Thirsk and two other astronauts landed in Kazakhstan, in central Asia, after deploying parachutes to slow its descent. 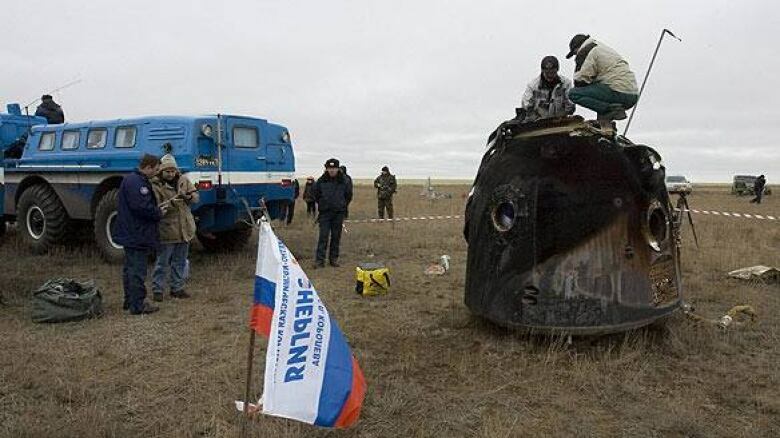 The Soyuz module landed upright about 80 kilometres northeast of the town of Arkalyk in northern Kazakhstan at 10:15 a.m. Moscow time or 2:15 a.m. ET. Braving icy weather, Russian recovery crews extracted cosmonaut Roman Romanenko, Thirsk, and finally Belgian space station commander Frank De Winne from the module. "The landing was very soft; we were lucky not to have any wind," Romanenko said after leaving the capsule. "Everything went quite nicely; there were no problems whatsoever." As is the custom with space travellers returning on Soyuz vehicles, all three were carried on stretchers to a nearby all-terrain vehicle. The cold weather grounded the helicopters normally used to recover landing astronauts. This was the first December landing of a Soyuz capsule since 1990. The three astronauts were driven to Arkalyk and were expected to be flown to Star City in Moscow later Tuesday. At a briefing at Russia's mission control centre, Steve MacLean, president of the Canadian Space Agency, called Thirsk's six-month stay in space a "turning point," and thanked the space station crew for "superb work that was done on orbit." Industry Minister Tony Clement praised Thirsk as a "modern Canadian explorer." "Over the length of his career, he has spent a total of 206 days in space, which surpasses the total number of days spent in space by all other Canadian astronauts combined," said Clement. In his last news conference from the space station, Thirsk said he was looking forward to seeing his family again in Moscow. 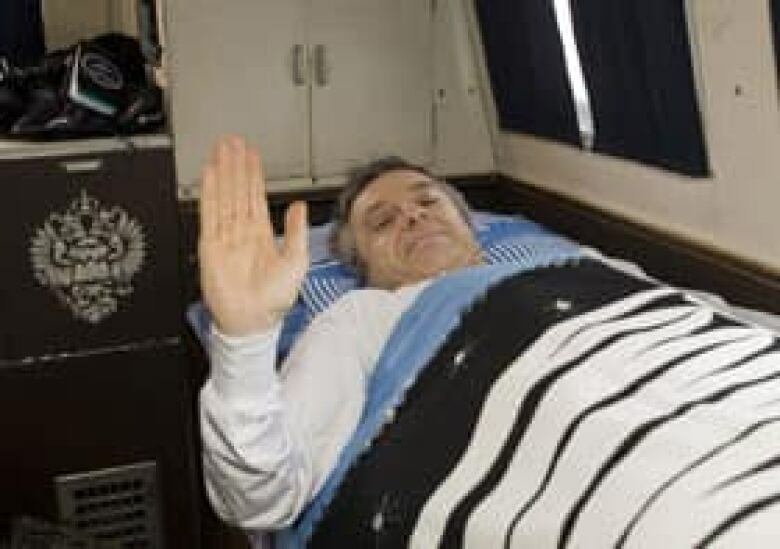 Canadian astronaut Bob Thirsk waves as he rests inside a vehicle of the Russian Space Agency following his landing Tuesday in northern Kazakhstan after six months in orbit. ((Shamil Zhumatov/Associated Press)) The father of three had been living and working on the space station since May 29 after arriving aboard a Russian Soyuz. His visit marked a pair of firsts: not only was it the longest space stay for a Canadian, but it also marked the first time two Canadians have ever crossed paths in outer space. During his extended stay, Thirsk accomplished the latter feat twice. He was visited by Julie Payette in mid-July, and in October Canada's first space tourist, Guy Laliberté, made a visit. One of the goals of the six astronauts on the space station was to gather information on the effects of space on the body. Thirsk, 55, took part in dozens of experiments, worked on maintenance and repair of the space station and served as the mission's medical officer and robotics specialist. He shared his thoughts and views from space on the Canadian Space Agency website, including pictures of smoke rising from fires in Alberta and British Columbia during the summer. On Monday, the longtime astronaut admitted to feeling fatigue after his 189 days away and looked forward to a hot shower and haircut. "Re-acclimation to gravity will proceed slowly," he wrote. "I expect that my muscles, heart and sense of balance will recover to their pre-flight conditioning after several weeks."